Reflections about Life, Love, Light, and Liberty (the 4-Ls) by Leroy Seat. Vital Conversations is a monthly discussion group that meets in the Northland of Kansas City. June and I have been regular members of that group for more than twelve years now, and we have enjoyed many profitable discussions there. 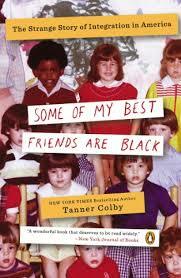 At the March 13 Vital Conversations meeting, the 25 or so who attended discussed Tanner Colby’s book Some of My Best Friends are Black: The Strange Story of Integration in America (2012). The meeting was a very helpful one, especially since there were four African-Americans present—including the venerable Alvin Brooks (b. 1932), a civil rights leader who is a former police officer and former city councilman of Kansas City. The second part of Colby’s book is about racial segregation in housing—and in getting loans for purchasing a home. The situation in Kansas City is a prime example of segregation having been actively enforced by housing planning—and restrictions. In particular, Colby writes about J.C. Nichols, whom Colby (no doubt rightfully) calls “the most influential real estate developer” in the U.S. during the first half of the twentieth century. Colby adds, “One could make the argument that he still holds that title today, despite being dead for sixty years.” (p. 82). Nichols was the developer of Kansas City’s Country Club Plaza, regarded as the nation’s first shopping center. After his death, he was memorialized with the impressive J.C. Nichols Memorial Fountain, just east of the Plaza, and the nearby street renamed the J.C. Nichols Parkway in 1952. In addition to the County Club district and Plaza in Kansas City, Missouri, a lasting legacy of J.C. Nichols is the development of Johnson County, Kansas, whose eastern border is just a mile west of the Plaza. That story, which is told to some extent in Colby’s book, is the theme of the novel The King of Kings County (2005) by Whitney Terrell, a nephew by marriage to J.C. Nichols’ son Miller. As Colby writes, the novel “tells the story of Kansas City’s blockbusting and suburbanization in a way that only a novel can: fictionalized, but brutally truthful” (p. 291). Adam Hamilton is the best-known Christian pastor in Johnson County, Kansas. He is pastor of the 20,000-member Church of the Resurrection, said to be the largest United Methodist Church in the U.S.
“Troost Avenue” is the title of the fifth chapter of Hamilton’s 2018 book Unafraid: Living with Courage and Hope in Uncertain Times. As also explained in the books mentioned above, Hamilton writes, “The street in Kansas City that serves as the dividing line between predominantly white and black communities is Troost Avenue” (p. 57). As some blacks sought to move west, Nichols and Bob Wood, an unscrupulous realtor, found ways to profit greatly by the development of Johnson County. They developed “restrictive covenants” that prevented African Americans from buying homes in many of the new, and white, communities. Black homeowners and communities were also greatly disadvantaged by redlining and other means that meant financial loss. I used to think that racial segregation was bad because of the deprivation resulting from being separate—and certainly repressive restrictions and lack of freedom are major problems. But I have come to see that maybe the worst aspect of segregation has been the financial inequity entwined with forced separation. 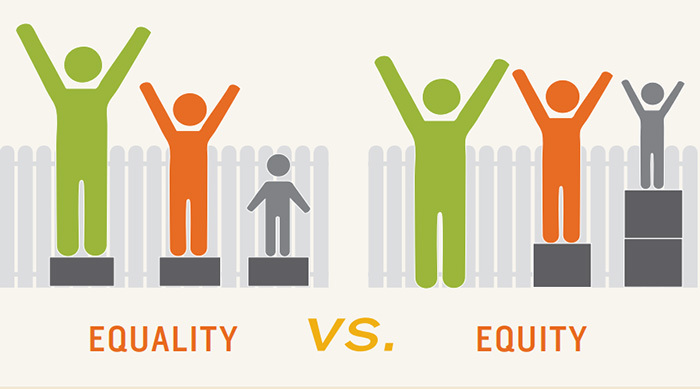 Perhaps now the major goal is not integration (or equality) but rather thoroughgoing equity. "Your closing statement moves the discussion in the right direction. Does the question of equity apply to a social analysis broader than ‘race’?" Yes, Temp, even though my article was primarily about the racial problem in Kansas City, and elsewhere, I certainly think that the matter of equity applies to all aspects of society. 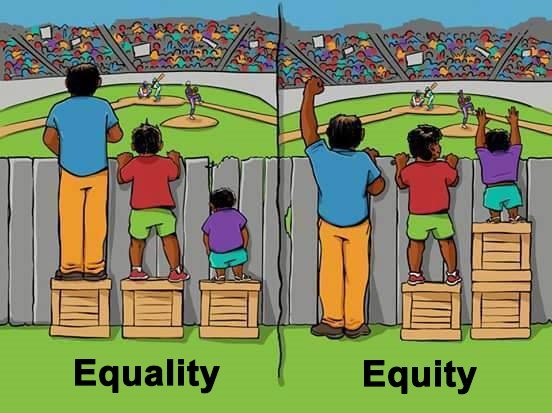 There needs to be equity for all. "I think you and I share similar conclusion, Leroy. Our challenge is to find a way to overcome inequity in distribution of wealth!" "JOIN US AS WE STRIVE TO CULTIVATE A COMMUNITY SEEKING RECONCILIATION TO TRANSFORM TROOST FROM A DIVIDING LINE INTO A GATHERING PLACE, REVEALING THE STRENGTH OF ALL." "We have the same here with zip code 53206." Bob, one of the books referred to in the article says that every major city has a street (or railroad tracks) that divides the city in the same sort of way Troost Avenue does in Kansas City. There is a wonderful little children's book by Debbie Anderson which is a remake of the song and titled "Jesus Loves the Little Children". Seven verses which cover more than skin color. A great sing-along lesson. So much for "free markets." Somewhere J. C. Nichols must be laughing at what he has wrought. There is an older term, "political economy," that admits that how an economy operates, and who benefits from it, is more of a political result than an economic result. I am reluctant to put the title "worst" on anything since I may have overlooked something. Other than that, I agree that redlining and racial covenants are a horrible part of American history which still cast a long shadow on our country today. As recently as the 2008 Great Recession, when the dust settled the devastation to black family wealth was far greater than to white family wealth. Yet not one banker went to jail for illegal, fraudulent subprime loans with which black families were targeted. Wealthy blacks were denied standard mortgages for which they qualified. Poor black were sold homes with mortgages they had virtually no chance of ever repaying. Only vulture capitalists celebrated the carnage that followed. America was born in genocide, raised on slavery, and found a "manifest destiny" in empire. Perhaps we should be concerned that we now have our very own Nero, fiddling on Twitter while one half of America burns, and the other half drowns. The mills of God may grind slowly, but they sure have been grinding loudly of late! Sounds like the history of the rest of the world. Slavery, wars, tribalism, religion... Each heralds its own praise. And the victor sets the terms. I personally look at my "home" continent of Africa in the post-colonial years (see "Homeland" by Michelle Frost) and the new imperialism of China brought in by the former American Communist, WEB Dubois and his "African Socialism" - they are paying the high price, Ndugu. (Laissez faire is no better.) History keeps repeating itself. Including strains of various economics... But everywhere, all know "to the victor goes the spoils" - whether tribe, religion, or economics, it works. With age and experience, we have all been burned, and somehow must learn to forgive. Would that we could find reconciliation that was just for all, without the militancy. Jesus loved, and commanded it, and so we seek love and goodwill, but still lack trust - even of other followers of Jesus. Is It Anti-Semitic to Criticize Israel?